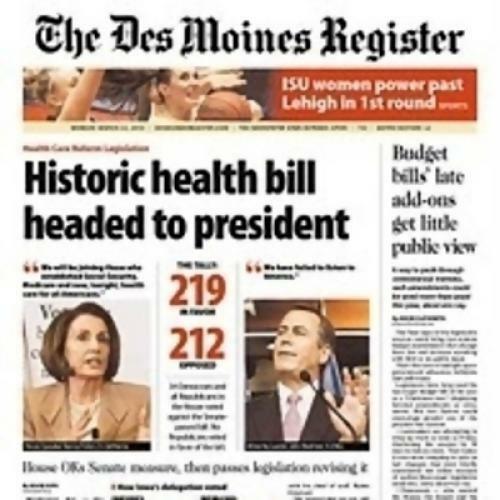 This week's On the Media laments the low quality of press coverage in health care reform. It's certainly easy to find examples of shoddy journalism and public ignorance to bolster this charge. Every night, one could watch cable TV screamers trafficking in untruths about death panels, or commentators offering with certitude political predictions that (a) were generally wrong and (b) generally detracted from discussing the actual substance of a hugely important piece of legislation. This version corrects the original editorial which implied that physicist Stephen Hawking, a professor at the University of Cambridge, did not live in the U.K. It's equally easy to find signs of public ignorance and innumeracy. These failings are pervasive across the political spectrum. Perhaps oddly, I find these failings especially annoying among people who disagree with me. Because it is so easy to find bad reporting and public stupidity, it is easy to overlook something. Press coverage of health care reform was the most careful, most thorough, and most effective reporting of any major story, ever. Throughout this past year, moderately informed and inquisitive readers could get more accurate information, more quickly, and more carefully-analyzed than one ever could before. I concede that one needed to know where to find this information. If you relied (say) on Fox News or the New York Post as your cognitive portal, it was easy to remain severely misinformed about even the broad outlines of what was proposed. I don't know how much of the resulting ignorance should be laid at the broader media's doorstep. My judgmental half wants to apply the term "operator error" rather liberally here. If you read any of the top five or ten national newspapers or (often even better) their accompanying websites, you were only a few clicks away from a remarkable and free library of analysis and supporting information of remarkable depth and diversity. If people don't look, there is only so much the media can do. My less-judgmental half is more forgiving. Many Fox viewers or New York Post readers don't realize how misleading (and sometimes straight-out false) the coverage really is. Among the biggest consumers of these news resources were … TV, web, and print reporters. Many of these reporters began the 2008 campaign in complete ignorance of the most basic features of American health policy. I spent dismaying amounts of time on e-mail or on the phone with reporters explaining the difference between Medicare and Medicaid or what SCHIP was. A few months later, some of these same reporters knew more than I did about key provisions in the final bill. This lesson came home to me last Thursday, when my daughter and I watched a spirited debate on health reform. Those representing the Democratic side started strong, quoting Norm Daniels on health as a human right, Jacob Hacker on the eventual need for a public option, Paul Krugman on the determinants of rising health care costs. They included poignant anecdotes of people denied care, and they noted the inefficiency of job lock addressed in health care reform. Republican speakers responded by noting the possibility of adverse selection within the exchanges. They argued that legislated penalties were too low to really enforce the individual mandate. They worried that expanding Medicaid enrollment will hurt state budgets. In response, Democrats responded with a detailed defense of the mandate. They also noted that managers' amendments included additional monies for states to cushion the financial blow. The people making these arguments were not health policy experts or professional politicians. They were members of the Homewood-Flossmoor High School debate team. Starting with essentially zero knowledge and age-appropriate skills, they had gone out and mastered the debate with admirable detail and clarity. In part, the high quality of news coverage reflected the sheer commitment of journalistic resources in a time of economic challenge to the entire industry. The New York Times and The Washington Post fielded a dozen of the best reporters in America for a year to cover this story. The Wall Street Journal, Newsweek, the Atlantic, and Time made major commitments, too. The legislative slog was maddening and sometimes boring. Yet the slow pace gave reporters time to actually understand the intermingled health-system and public health challenges the president and Congress were trying to address. The public cared, too. Health care touches everyone in America. So do the accompanying costs. Millions of people wanted to know what is happening, and how it affects them. Coverage also reflected the capacity of the Internet to go deeper and faster into news stories than one could do before. When the Tea Partiers shouted "Read the Bill!" one could get on the web and do precisely that. Someone will even read the bills to you, if you wish. I was amazed by the number of key players willing to give long and detailed on-the-record interviews to more knowledgeable reporters than those who populate the Sunday talk circuit. No legislation of this scale is passed without some backroom dealing and hard bargaining. Much of this dealing and bargaining was reported on the web or in print within hours of being done. At times, the process was too transparent. I worry that Congress and the president need more private space to get things done. There was so much information that the biggest problem was to sift through it all. Reporters, citizens, advocates, and policymakers all struggled to figure out what complicated provisions actually meant. Some provisions of the final bill—for example the CLASS Act—were themselves 14-figure initiatives which would, in any other context, be viewed as major changes in American social policy. Over time, reporters and organizations that could clarify these complexities became critical resources. The Congressional Budget Office, despite its challenges and shortcomings, was the one indispensible resource. Other essential resources were developed over many years and reflected longstanding commitments by several foundations to support health policy research and reporting. The Kaiser Family Foundation has spent years developing tools and expertise in analyzing legislation and policy concerns in Medicare, Medicaid, and a host of other programs. Virtually every reporter, advocate, and policymaker ruthlessly mined KFF's side-by-side comparisons to understand the profusion of competing proposals and bills. The Robert Wood Johnson and Commonwealth Foundations played similar critical roles, supporting Institute of Medicine reports, disseminating health services research, and more. Peer-review medical journals such as JAMA and the New England Journal published dozens of clinical and policy commentaries that were vetted through peer review and that influenced media coverage. As a field, health policy can be contentious and political. Yet it includes a diverse group of interest groups and constituencies that can mobilize impressive expertise to advance their perspectives. Some reporters, professors, and commentators cemented their star status by performing this translation function well. The heavy lifting went beyond a relative handful of famous people covering the story. I and many others religiously checked David Dayen's whip count at Firedoglake, for example. Celebrity reporters were calling and citing people who are not always household names, but who belong to a huge expert community of people who genuinely know something about pressing health policy concerns. For example, Timothy Jost and Joseph White became leading commentators on legal and administrative obstacles to reform. Howard Gleckman wrote important material on disability policy. Dana Goldstein, Digby, and Michelle Goldberg covered reproductive rights. Michael Chernew, Austin Frakt, and others clarified long-term budget matters and the drivers of medical expenditure growth. Merrill Goozner, Shannon Brownlee, and Maggie Mahar did similar work understanding the necessity, but also the limitations, of comparative effectiveness research and health information technology in controlling costs. I can't possibly name everyone; I certainly won't try to. Covering major reforms to a $2.6 trillion economic sector required a deep, deep bench. One other element was quite noticeable in this health reform debate: The everyday commitment and skills of working journalists pursuing the story. I'm proud of some of the work I've done, but I'm not a real journalist in the same way many of my colleagues are. I bring complicated biases and constraints as a public health researcher and advocate. With rare exceptions, I was not doing shoe-leather reporting, chasing down news sources, or cajoling congressional staff for leads. I spent much of the past year analyzing and discussing information gathered by others. There is a craft to good reporting and careful journalism. I have huge respect for people who practice their craft well. Sustaining the journalism enterprise isn't easy. Much as I admire the coverage of health reform, I worry that coverage will lag behind on other important matters, climate change being the most obvious case in point. The best reporters on this beat are as good anyone writing on health. As a rule, though, reporters generally know less about these issues. These issues seem complicated, unfamiliar, and boring. They do not touch people in the immediate way that health care does. As in health reform, there is an advocacy base and an academic infrastructure to help reporters convey a technical subject to the wider public. Yet that infrastructure seems weaker and less diverse in viewpoint, skills, and material interests than is available in the arena of health. Matching what was done on health care will be a daunting challenge. That's scary, because climate change (and immigration and financial reform) are no less important.